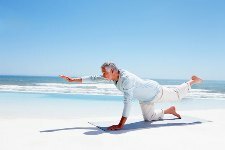 Home » General Health » Is Yoga Safe for Seniors? Is Yoga Safe for Seniors? Seniors have often been recommended to pursue yoga. This type of exercise seems to be particularly suited to the needs of an older adult. Yoga is generally thought to be a low-risk, gentle approach to building and maintaining muscular strength and flexibility. However, this may be somewhat of an idealized view. Some yoga poses may pose a threat to older tendons and joints and potentially cause strains and sprains. Recently, a study was funded by the National Centre for Complementary and Alternative Medicine—an organization that believes in the ability of yoga to improve health—to study the physical demands of yoga poses in older adults. The research team, from the University of Southern California, chose six common standing poses to assess. These poses, the researchers hypothesized, were most likely to cause problems for weaker, more injury-prone musculoskeletal systems of seniors. The seven poses were: chair, wall plank, tree, warrior II, side stretch, crescent, and one-legged balance. They found that the demands on tendons, muscles, bones, and ligaments varied from pose to pose, with some asking much more of the musculoskeletal system than others. For this reason, the researchers suggest that many older adults really need to have an individually-designed yoga program. For example, someone with a spinal problem, whatever its nature, may not want to attempt a pose that relies heavily on back muscles. Instead, a program could be developed that specifically strengthens back muscles without demanding too much from that particular muscle group. Likewise, someone who has a “bad knee” should not be attempting the “one-legged balance.” This could put too much strain on the affected knee, risking a fall or injury. Instead, a yoga program could be developed to strengthen knee tendons and ligaments without placing undue strain on them. This is a much different approach to yoga than North Americans are used to taking. Most of us simply join classes and follow along as best we can, hoping to “keep up” and perhaps pushing ourselves to do poses that our bodies are not ready for. Designing safe and effective yoga programs for seniors is something that will likely become standard practice in the future. For now, if you are a senior and you would like to use yoga for its healing benefits, you may need to work with a qualified yoga instructor or physiotherapist to develop the correct sequence of poses for your individual health concerns. The advantage to taking this approach, while definitely more of a hassle, is that the yoga program can then be revamped if your particular health issues begin improving. Certainly avoiding yoga altogether is probably not the answer, because many studies do attest to its healing abilities. The key is to practice yoga and benefit from its healing powers, while staying safe. Wang, M.Y., et al., “The biomechanical demands of standing yoga poses in seniors: the Yoga Empowers Seniors Study (YESS),” BMC Complement Altern Med. January 9, 2013;13:8. Yu, S.S., et al., “The physical demands of the tree (vriksasana) and one-leg balance (utthita hasta padangusthasana) poses performed by seniors: a biomechanical examination,” Evid Based Complement Alternat Med 2012: 971896. Galantino, M.L., et al., “Safety and feasibility of modified chair-yoga on functional outcome among elderly at risk for falls,” Int J Yoga. July 2012; 5(2):146-50.